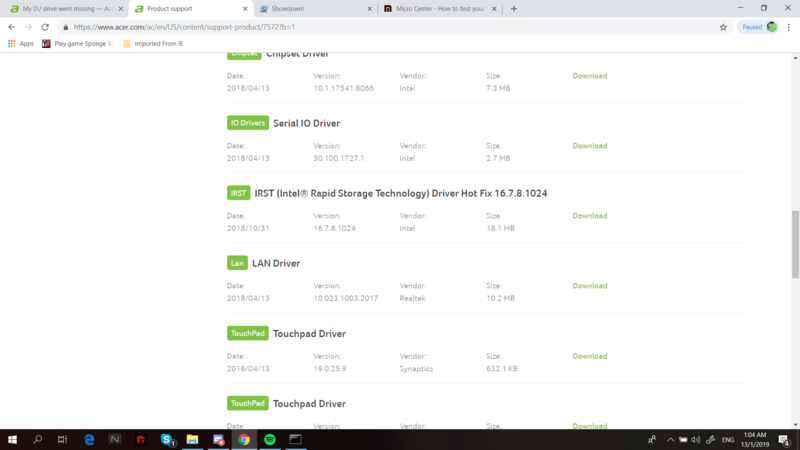 After updating intel rapid storage technology my D drive dissapear i cannot do anything i search it,not there,look up tutorial, still does not work.I am using my nitro 5 right now but is there any way to help me to get my D drive back. Great! Me and colleague JackE help you! Accept my answer and colleague JackE to put the topic as resolved and so that other users can see the solution! (1) Delete old IRST driver. (2) Turn machine on and immediately start tapping the F2 key to enter the BIOS menu. (3) Do you see D drive listed in the Information Tab? It should be listed as HDD1. i saw it what next?